Cleveland City Hall is located at 601 Lakeside Avenue, Cleveland, OH 44114; phone: 216-664-2000. Photo: Home on East 89th Street in the East 89th Street Historic District. The Historic District was listed on the National Register of Historic Places in 1988. Photographed by User:Nyttend (own work), 2009, [cc0-by-1.0 (creativecommons.org/publicdomain/zero/1.0/deed.en], via Wikimedia Commons, accessed May 2013. The history of Cleveland may fairly be said to begin on September 16, 1796, when Augustus Porter, the principal surveyor of the Connecticut Land Company, commenced laying out a few streets on the right hand side of the Cuyahoga River, at its junction with Lake Erie, for the purpose of establishing a village at that point, which it was hoped would one day become a city. Mr. Porter ran out the street lines, while his assistants, Messrs. Seth Pease, Amos Spafford and Richard Stoddard surveyed the "city" lots, or at least a part of them. By the first of October the work was completed and a rude map of the proposed city was made by Mr. Spafford, which he published in Colonel Whittlesey's Early History of Cleveland. The work of course was under the general superintendence of General Moses Cleaveland, the agent of the Connecticut Land Company, as well as one of its principal stockholders, who had charge of the operations in the field during that year. It was at this time also that the location in question received the name, which, with the exception of a single letter, it has ever since born. Previously it had been spoken of in the minutes of the surveyors as "Cuyahoga," or sometimes as the mouth of the Cuyahoga. The city in 1797 contained two log houses, one of them having been built as a quarters of the party that was surveying the "Western Reserve." The other, near the junction of Main Street and the river, was the storehouse of the surveyors, built during the same season. Mr. Spafford's Map of October 1, 1796 shows a "public square" containing 10 acres, with Superior Street running through it parallel with the lake shore. It had first been named "Broad Street" and that name had been written out on the map, but had been stricken and Superior substituted. Six streets (Bath, Lake, Federal, Superior, Huron and Ohio) were all that were at first surveyed to run parallel with the lake shore, and generally called "east and west" streets. The "north and south" streets, those at right angles with the lake, first surveyed, were Water, Ontario, Miami and Erie. City lots numbered 58-63 and 81-87, comprising all the lots bordering the public square, and one more, were to be reserved for public purposes. Then Mr. Porter proposed to begin numbering with lot 1 and offer for sale every 4th number in succession through the town. Each person who would engage to become an actual settler in 1797 might purchase one town lot, one 10 or 20 acre lot, and one hundred-acre lot, or as much less as he might choose; settlement, however, to be imperative in every case. The price of town lots was to be $50; 10-acre lots, $3 per acre; 20-acre lots, $2 per acre. The town lots were to be paid for in ready cash; for the larger lots, 20 percent was to be paid down, and the rest in three annual installments, with annual interest. In 1800 the population of the tract of land laid out as the city still consisted only of the families of Carter, Spafford and Clark, Stephen Gilbert and perhaps Joseph Landon, making a total of about 20 persons. In the whole territory eventually included as part of the city, however, there must have been between 60 and 70 present. In July of 1800 Cleveland became part of the county of Trumbull, which embraced the whole of the Western Reserve. In August, the civil township of Cleveland was organized, together with 7 others. During the winter of 1800 and 1801, Gilman Bryant cleared 5 acres on the bank of the Cuyahoga just above the town plat. In the spring of 1801 Timothy Doan, a brother of Nathaniel, came to Cleveland, but removed to Euclid in the autumn. A somewhat distinguished arrival of this season was Samuel Huntington, a lawyer, about 35 years old, nephew of the governor of Connecticut of that name, who, after traveling through a large part of Ohio, had determined to make his future residence at Cleveland. He built a large, hewn log house, the most aristocratic residence in the place, on the south side of Superior Street, near the top of the bluff, and to this he moved his family in the fall. He also, during the same season, caused the erection of the first frame building in the city — a barn built by Mr. Samuel Dodge. 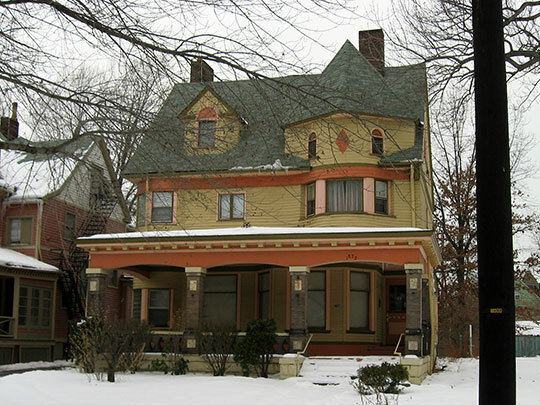 Elisha Norton, a trader, made his home in Cleveland with his family the same year. About one family per year seems to have been the increase of Cleveland for several years at this period. In 1804, Oliver Culver, one of the party who surveyed the Western Reserve, brought out some goods (salt, calico, liquor and tobacco) to trade with the Indians but after one season's experience returned east and did not repeat the experiment. A post office was established in October, 1805 with Elisha Norton serving as the first postmaster. After 1825 the population of the then-thriving village of Cleveland had grown in 12 years to some 5,000, and the place attained the dignity of a city. In the session of 1824-1825 Congress granted $5,000 to construct a harbor at Cleveland. A pier was built extending 600 feet into the lake, beginning 40 rods east of the east bank of the Cuyahoga River at its mouth. The year 1836 saw the climax of the great land speculation which had been raging with such extraordinary violence for 3 or 4 years throughout the country, and especially along the great line of emigration, extending from the East to the West, which passed along the southern shore of Lake Erie. City lots doubled, trebled and quadrupled in price in the course of a few months, and each successive advance seemed a new evidence of prosperity and a new reason for higher prices. The authorities of the new-born city were quite willing to exercise their power to improve and beautify the tract committed to their charge. The grading of streets, etc., went with great vigor. From March 15 to November 28, 1836, the number of sloops, schooners, brigs and ships arriving with cargoes at the port of Cuyahoga was 911, while the number of arrivals of steamboats with passengers was 999; an enormous aggregate, when considering that it had been only 16 years since the first steamboat had appeared on the waters of Lake Erie, and only 11 years since the number of arrivals of every description was but from 40 to 50. By 1850 the population of Cleveland had risen to 17,000. It was pre-eminently a commercial city, its chief business being to receive produce from northern Ohio and ship it to the East, to transmit Eastern goods to the agricultural regions, and to send on the West the immense number of emigrants and others who sought that land of promise. The building of the railroads between 1850 and 1855 did not change the character of the business, but greatly widened its operations. Cleveland merged with its neighbor, Ohio City, about 1854. The census of 1870 counted 92,000 residents. A large tract comprising parts of the townships of East Cleveland and Brooklyn were annexed in 1872, with one-time rival Newburg also annexed a year later. Memorial Record of the County of Cuyahoga and City of Cleveland, Ohio, The Lewis Publishing Company, Chicago, 1894. Chrisfield Johnson, compiler, History of Cuyahoga County Ohio, D. W. Ensign & Company, Press of the Leader Printing Company, Cleveland, 1879.